Football fans are, by and large, optimists – and none more so than Noel Gallagher, the one-time guitarist and songwriter with Oasis. At the time we spoke, the 44-year-old – now a chart-topping solo artist – was full of hope that his beloved Manchester City would win a clean sweep of trophies in 2012. Fate – and Manchester United – intervened in the FA Cup, nevertheless the rest of his dream – that City win the Premier league, the Carling Cup and the Europa league – is very much alive. "I hope the world doesn't end – because they say it might," he added. "It would be nice if they could delay the end until City have won the league." 2011 was certainly a year in which Gallagher himself surpassed many expectations. 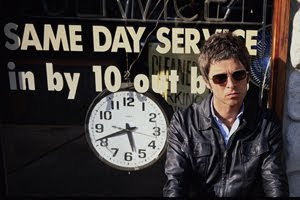 Two years after abruptly quitting his own band moments before a concert in Paris, the 44-year-old emerged with a new musical guise, Noel Gallagher's High Flying Birds, and an album which garnered his best reviews since Definitely Maybe and (What's The Story) Morning Glory, at the highpoint of Britpop. After 18 years consumed in band politics, Gallagher enjoyed the freedom of being his own boss. "In the studio, yes [it was creatively liberating]," he recalled, "because I could work at my own pace, which is important for me." If he wanted to work three days in a row, he could; if he wanted a break he could take one. With Oasis, he had to be ever-present.